Iron is a crucial mineral needed during pregnancy. Read on about why and how to get enough for you and your developing baby. You will rarely hear more about the importance of iron than during pregnancy. Your body uses iron to make haemoglobin – a substance in red blood cells – which transports oxygen throughout your body. When you are pregnant, your body also supplies blood and oxygen to your baby too, so the need for iron increases to keep up with the increase in blood supply. Daily iron requirements vary depending on age and gender. Males aged 18+ and women over 50 need 8.7mg daily. However, it’s recommended that women who are having monthly periods have 14.8mg. FACT: You need twice the amount of iron when pregnant (30mg per day) than you do when you’re not pregnant. 35% of pregnant women become iron deficient in their first trimester and 85% will have become iron deficient by their third trimester. Iron deficiency is especially common in women carrying twins, vegetarians or women who are having pregnancies close together. Menstruating and pregnant women need more iron than men. Getting enough iron from food when you're pregnant can be difficult, even if you're carefully trying to add iron to your diet. This is especially true if you're a vegetarian or vegan because you do not consume iron-rich meats or poultry. Be sure to tell your doctor if you are a vegetarian so they can keep a closer eye on your iron and haemoglobin levels. It is very common for women to develop iron deficiency during pregnancy. This is because your body needs extra iron so that your baby has a sufficient blood supply and receives all of the necessary oxygen and nutrients. Many pregnant women require an iron supplement, particularly from the 20th week of pregnancy. If a lack of iron in your diet is thought to contribute to your iron deficiency anaemia, your GP will advise you how to include more iron in your diet. Heme iron is the type your body absorbs best, so it’s a good idea to especially focus on these foods to help keep your iron levels up during pregnancy. You get heme iron in beef, chicken, turkey, pork and fish. Nonheme iron is the other type, which you can find in beans, vegetables (spinach), tofu, dried fruits, eggs, whole grains and ready-to-eat-cereals that have added iron. If you have iron deficiency anaemia, eat plenty of iron-rich foods, such as those listed above. Interestingly, what you consume with your iron can affect how well your body absorbs the mineral. While you eat foods that are high in iron, have them with foods that contain Vitamin C, such as tomatoes and oranges. Vitamin C helps your body absorb nonheme iron better when you eat both at the same meal. Pregnant women with severe anaemia have an increased risk of developing complications, particularly during and after the birth. They may also develop postnatal depression. Iron deficiency can lead to fatigue, light-headedness, and dizziness. When you throw those on top of typical pregnancy symptoms it's a double whammy. So be sure to mention any unusual symptoms, including exhaustion that seriously disrupts your day, to your doctor. Compared with taking no supplements, taking iron supplements increases the mother’s haemoglobin levels, and halves the risk of the mother becoming anaemic during pregnancy. Taking these supplements also resulted in the baby being an average of 41g heavier at birth and reduced the risk of low birthweight by 19%. Women are not advised to take iron supplements unless a doctor has identified low iron levels as a result of a blood test. This is due to the fact that low iron levels in the blood can also be linked to other conditions such as Coeliac disease. Following your course of supplements advised by your doctor, it is important to have another blood test to ensure your iron levels have returned to normal. Most doctors will check your iron levels when they do labs during the first trimester and again later on in pregnancy. If levels are low, they will often recommend an iron supplement along with adding more red meat and leafy greens to your diet. 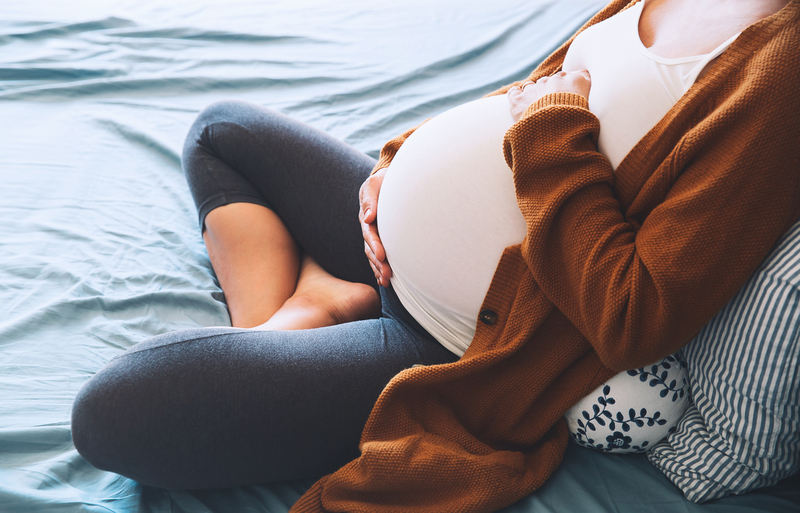 There is little risk of getting too much iron during pregnancy, especially if levels were already low, so following your doctor’s advice with regard to iron supplements is the best way to go. You’ll need at least 30mg of iron every day during your pregnancy. While breastfeeding, it is important to get at least 9mg of iron every day if you’re 19 and older, and 10mg if you are 18 and younger. Again, ask your doctor for further advice on iron intake and supplements. However, not all iron supplements are the same, and many women experience unpleasant side-effects (such as constipation or nausea) from conventional iron tablets due to the fact that iron absorption from conventional iron tablets is estimated to be up to 10%. That means you take a high dose of iron (usually around 60mg) but only absorb a little. The good news is – even if you develop an iron deficiency during pregnancy, it is likely that your iron levels will return to normal after you give birth – usually within six weeks. However, if your levels were low during pregnancy, continuing to increase your dietary iron intake will help rejuvenate your body’s store of iron, giving you the energy you need to keep up with the new little one in your life. 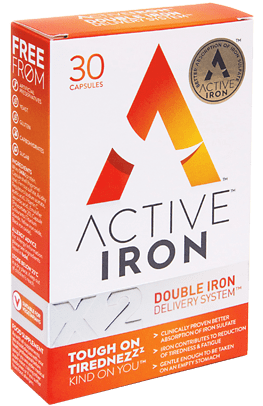 Brought to you by Active Iron, available in your local CarePlus Pharmacy.